Hi there! 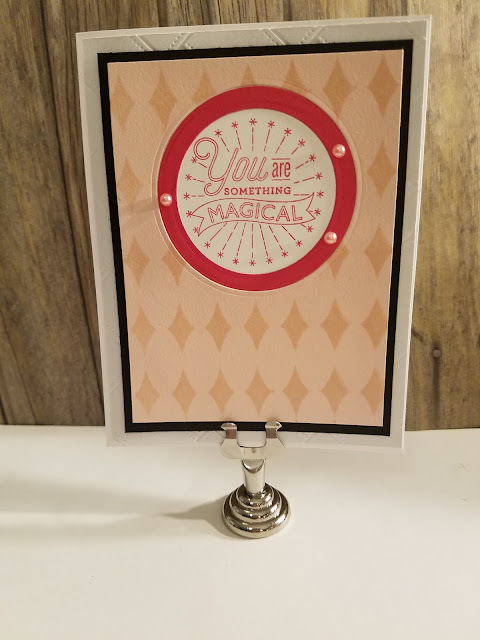 I have a card for the Color My Heart Color Dare - use Pebble, Raspberry and Bashful. All supplies except the embossing folder and black cardstock are from Close To My Heart. I started out with my Pebble layer embossed the the Matelasse embossing folder. A layer of Bashful cardstock was die cut and matted with some black cardstock. I used the Winnie and Walter Harleen stencil and sponged on some Bashful ink. Then I have a frame of Raspberry cardstock. I stamped the sentiment from Something Magical in Raspberry ink.. I added a few Bashful pearls to finish off the card. Very pretty card...like how you pulled in the pebble with the embossed background and great sentiment. Thanks for sharing with us at Color Dare this week, please check out our TicTacToe Challenge still open...you name your colors. Love that sentiment and the way it is surrounded with the bold Raspberry colour. A very pretty card - thanks for sharing with us at Colour Dare. Beautifully created card! I especially like the bright circle with the sentiment. Thank you for playing along at Color Dare. I really like how you sponged the bashful to create the tone on tone. Really pretty card! Thank you for joining us at Color Dare.